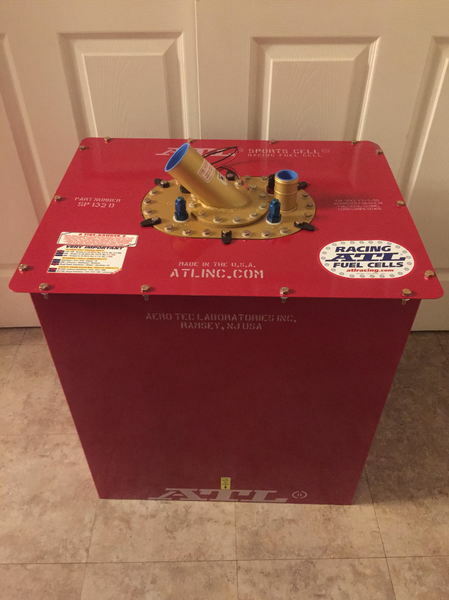 ATL 32 Gallon Cell, black box surge tank, CFD-600-HP fuel pump (internal), TF525 quick fill plate. Sports Cell model D but dimensions were rotated to better fit in a confined area. Dimensions are 25 Tall, with a 21x17 footprint. I had this cell built special through ATL back in April for a project I was working on but stopped and parted the whole build out. I hung onto the cell for many months after everything else was gone thinking I may be able to use it on the current vehicle but I cant. Its never been used for mock up, never been wired, never seen a drop of fuel, cap never has even been off. Zero scratchs, just took it out of the ATL shipping crate and foam last week to take these pics of it to post for sell. My loss, your gain. I have receipt on this cell from ATL where I paid 1830.00 for it in April, thats my price, MSRP is over $2250. Im asking 1000.00 to get it out of my way.